Does your team need a skills update, but time is pressing? Are you planning a management meeting and need to include a training element? 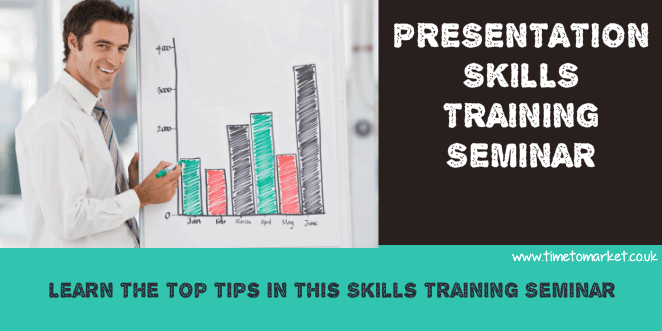 Then a presentation skills training seminar might well be right for you. The Top 20 Presentation Tips is a one hour seminar just for you. Because it's designed to get your team and your co-workers, motivated and inspired to achieve more with presentations. The Top 20 Presentation Tips is a one hour training seminar. It's designed to get your team and your co-workers, motivated and inspired to achieve more with presentations. Please don't hesitate to get in touch for advice on the presentation skills seminar. This fast-paced presentation skills training seminar involves your team getting up on their feet and speaking—publicly. So watch them learn to boost their presentation confidence. Then watch them discover how to open a speech with style. Your team can find out about all the top tips in this challenging and exciting skills training seminar. Many thanks once again for your inspiring presentation to the students a week ago. The Top 20 Presentation Tips seminar is an ideal agenda item for a company conference, a business services exhibition, a team building day or management meeting. It's fast-paced, simply delivered and there are no awkward set-up arrangements. That's The Top 20 Presentation Tips seminar. Just give us a call and we can talk you through the seminar details. "The brain can absorb only what the rear end can endure"